Do you dream of investing in style with a difference? 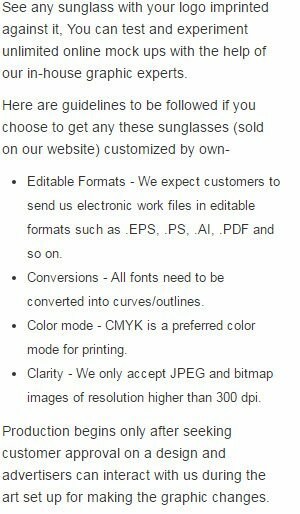 Yes, exactly we are talking about rubberized sunglasses. These rubberized custom sunglasses are made up of recycled material and they impart a very stylish and contemporary look to people wearing it. Customers coming to us can choose from the assortment of 8 colors offered at reasonably cheaper prices than many of our competitor websites. Available Colors: Black with Red, Black with White, Black with Purple, Black with Blue, Black with Pink, Black with Orange, Black with Green, Black with Yellow, White with Red, White with Blue, White with Green, White with Pink, White with Black, White with Purple, White with Orange,White with Yellow, Black with Black, Red with Red, Blue with Blue, White with White, Green with Green, Orange with Orange, Pink with Pink, Purple with Purple, Yellow with Yellow, Maroon with Maroon, Gray with Gray, Black with Maroon,Black with Gray, White with Gray, White with Maroon.